Dropkick Murphys and Flogging Molly--two giants of American punk rock that share a working class ethos, an Irish heritage and Celtic folk influence--just wrapped the initial leg of their first-ever co-headlining tour, celebrating over 20 years of mayhem, and are preparing to return to the road in September for more shows together. The second leg of dates kicks off September 17 in Edmonton, Alberta, Canada and winds across the West, wrapping on September 29 in Mesa, Arizona. 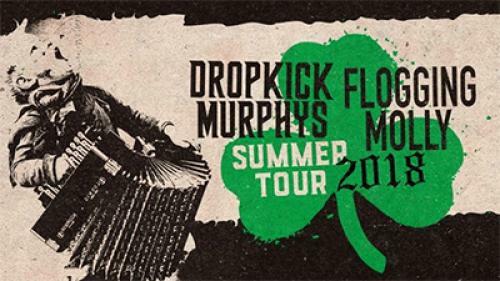 The initial run of North American shows for Dropkick Murphys and Flogging Molly culminated with the groups’ June 23 concert combined with a Murphys Boxing event in Gilford, New Hampshire, with the main event featuring Murphys’ fighter Mark "Bazooka" DeLuca (21-0) and Walter "Two Guns" Wright (16-4).